Regular service began August 5, 1984. The Amtrak Archives contains dozens of buttons and pins that span the company’s 45 year history. Primarily developed by the Marketing department, they highlighted new services, company-wide safety programs, sales promotions and other initiatives. Some were meant to be worn by station staff and onboard crew members, while others were given to customers as souvenirs. After making a stop at St. Joseph, Mich., the northbound Pere Marquette crosses the St. Joseph River, which is lined with marinas. The entrance to Lake Michigan is just to the west of this bridge. The Grand Rapids-Chicago route – one daily roundtrip by 1970 – was not included in the final system due to concerns over potential ridership, profitability and competition from other modes such as automobiles. Although Furniture City and other communities lost passenger rail service, they did not forget about the train. The Pere Marquette, employing a winter consist that includes bi-level Superliner cars, stops at Holland, Mich., on a snowy day. 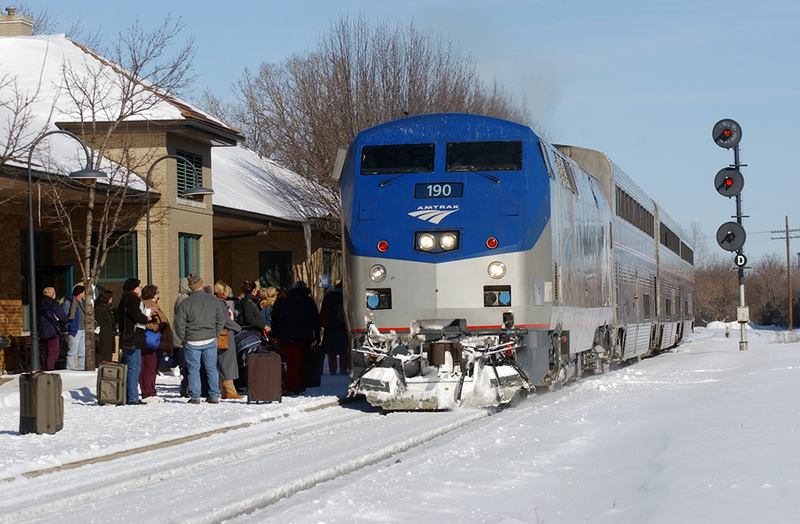 Crowds greeted the train at intermediate stations in New Buffalo, St. Joseph-Benton Harbor, Bangor, Holland and Grand Rapids, Mich., as well as Hammond-Whiting, Ind.4 Regularly scheduled passenger service began the following day. The commemorative button shown above features a stylized F40PH wearing the Amtrak Phase III paint scheme. Below it is the company’s first service mark, which was used from 1971 until 2000. The Pere Marquette remains a popular travel option for residents of southwest Michigan, which boasts beautiful lakefront beaches and communities known for their rich Dutch heritage. Nearly 96,000 customers rode the train in Fiscal Year 2015. 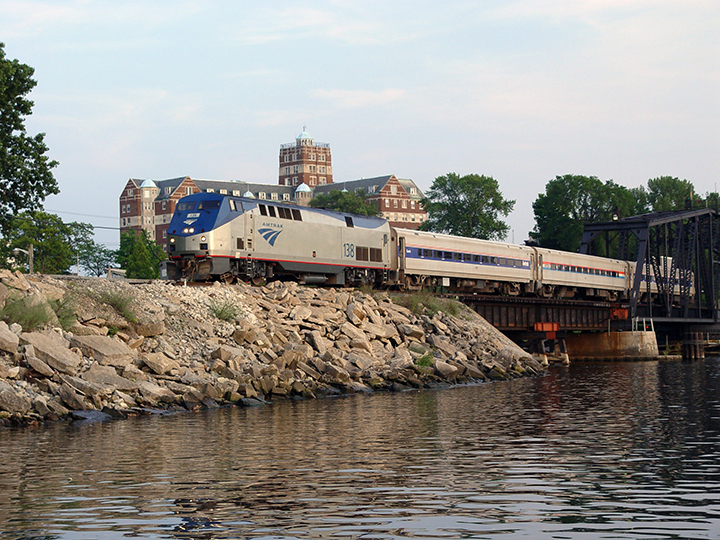 In addition to the Pere Marquette, the state also funds the Wolverine Service (Pontiac-Detroit-Ann Arbor-Chicago) and the Blue Water (Port Huron-East Lansing-Chicago). Altogether, more than 830,000 customers rode the Michigan trains last year. tower that glows at night. Image courtesy of The Rapid. In October 2014, local and state leaders joined with residents to dedicate a new, modern station in Grand Rapids. 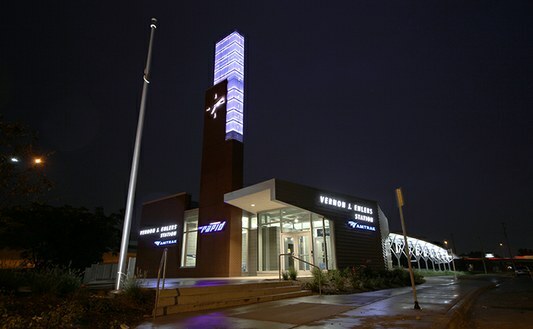 Named for former Congressman Vern Ehlers, the building sports a soaring clock tower with a crown of perforated stainless steel; at night, LED lights from within create a glowing beacon for travelers. Central Station, served by local Rapid and intercity buses, is located directly north of the new rail facility, thereby creating a convenient intermodal hub in the heart of the city. Were you part of the Pere Marquette inaugural celebration? Do you have a favorite memory of the train? Share your thoughts with us in the comments section! 1 Craig Sanders, Amtrak in the Heartland (Bloomington, Ind. : Indiana University Press, 2006), 209. 2 Amtrak, Annual Report of National Railroad Passenger Corporation (Oct. 30, 1970 – Oct. 29, 1971) (Washington, D.C., 1971). 3 “Railroad News Photos,” Trains, November 1984. 4 Pere Marquette service to Hammond-Whiting and New Buffalo was later discontinued, but the stations are served by other Michigan Service trains.